So here’s the thing about meat. That you may or may not be aware of. It’s a complicated industry, to put it lightly. One where, throughout recent history, most of what has been available to the masses has been sourced in a not very ethical and not very sustainable way. And did you know that an estimated 97% of Australian’s pigs are raised indoors with no access to the outside? Making doing their regular pig thing impossible. This leaves just 3% of pigs that are described as free range or organic. Pathetic statistic. In this minefield of an industry there are the animals and the farmers, the distributors and the buyers and the consumers. There are free range, bred free range, grass fed & grain fed. 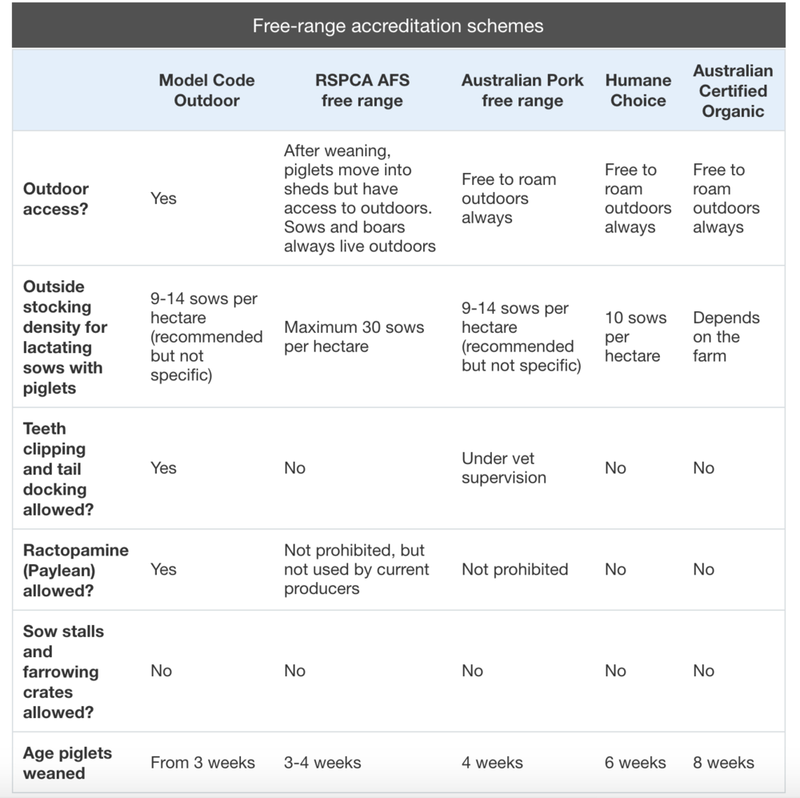 There are bio shelters and factory farms and cages and pastures; there are RSPCA, Free Range, Organic and industry accreditations. Making sense of it all seems pretty much impossible. I ask a lot of questions but the answers are anything but clear. Here's a graphic that tries to explain some of the most well known accreditations. Within these, there seems to be lots of movement between brands and farms and... fuzzy enough? So here’s another thing, that you may know but if you don’t here it is: We care a LOT about all of this. And want very much to be doing our best, as participants in this complex industry, to ensure that not only is the meat we source ethical, but that we are also contributing where we can to strengthening and promoting those within the industry who feel the same. I remember the first conversation Martin and I had about our commitment to exclusively using free range meat. We agreed that as animal (and yes, meat) lovers, we didn’t want to contribute to an industry that was not caring for the wellbeing of the animal. This was not always an easy choice, in fact, it’s been more hard than easy, by far. For the many years our little BBQ venture was making a loss, it seemed an easy option to cut our costs in half and go with the factory farm, feed lot option. Everyone else was doing it and our consumers probably wouldn’t notice or care. But we didn’t. Because it was a commitment we made and one that we felt defined so much of what mattered to us. Because it was the right thing to do for the animals and for our planet. And because we were sure that if we could find a way to communicate the importance of it to our consumers, they too would share our passion and be willing to pay more for this better product. So we continue to plough ahead with understanding and improving our connection to this promise. In 2013 Martin spent about a billion hours (fact) on the phone trying to find someone who could source free range pork and chicken and grass fed beef of the quantities and specs we wanted. We could find grass fed beef and free range chooks, but finding pork was endlessly difficult and initially, for a brief period, we settled on a bred free range product. In this instance, we were working directly with the farmer and believed in value she placed on the ethical treatment of her animals. In 2015 we finally found a supplier who could source us wholly free range pork products of the specs and quantities we required. From 2015-2018 – we moved between a couple of distributors who connected us to farmers like Borrowdale in QLD who provided an amazing product but still, we felt disconnected to the process and wanted to know more about where our meat was sourced and how it came to us. We continued to seek a direct farm to plate relationship and one that would cut down on our food miles. In 2018, we began working with Adam from Hopkins River Beef. He and his partner are based on the Peninsula but own farms across Victoria and process the meat at a plant nearby that they have invited us to visit. Having a relationship with Adam means we get to ask him directly about the animal, their processes and connect more deeply to our food. Adam is passionate about ethical farming so this relationship makes sense. Just this last month we moved to a new distributor who shares this same philosophy on ethical farming and ethical businesses. And they are providing us free range pork from farms in Victoria that gives us the opportunity to cut down our food miles and connect to the farms in a more meaningful way. So the reality for us is that meat eating and caring about animal welfare DO coincide. For most of us, in fact. And ethical farming and the meat industry need us to say that it matters. The more we do and the more you do through choosing to purchase these items, the more this will be the norm. 3%. Not good enough. We’re planning a trip to the farm. I wanna see it all. And the abattoir. Yes, the abattoir. All. We’ll continue to seek a direct paddock to plate relationship for free range pork in Victoria. We’ll continue to shout from the rooftops the importance of ethical farming and will maintain our exclusive commitment to it. We’ll continue to get better at and learn more about how we can be more ethical in our use of food at Red Gum. We’ll continue to ask you to care about it too and to ask your butchers and your supermarkets for it. And in the meantime – talk to us about our meat. Where do we get it from, how do we smoke it and why does it taste so good (cause obviously, healthy, happy pigs make yummy pork). Hold us to account and spread the word. Ethical farming matters. Free range matters. Supply and demand – let’s expect more, support farmers doing it better and help to create a more competitive free range industry where everyone benefits! Get on board!